Arefa Tehsin is our hero at the book club! Why? Well, for starters she has been a forest warden. 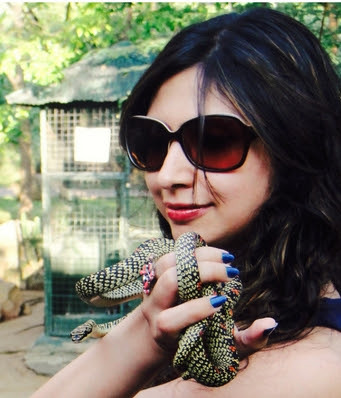 If that isn’t reason enough, we are awestruck by the fact that she gets to live admirably close to wild animals and writes books about living creatures we know very little about! This year has been extra special for the lady. 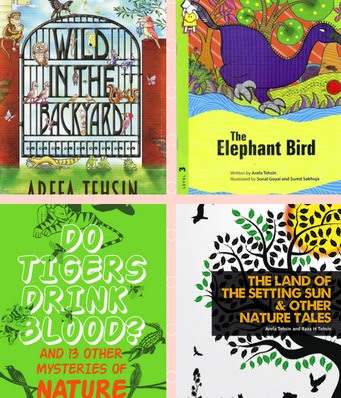 After her book The Elephant Bird became Pratham Books’ choice for PBChampions, to be read across 3200 locations simultaneously in September, Arefa has scored another hit with her book Wild In The Backyard. She has been shortlisted for The Hindu Young World – Goodbooks Best Author Award 2017 to be announced in January. 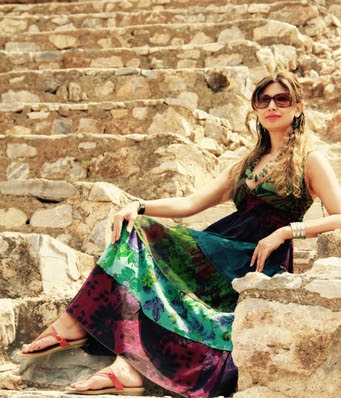 Harshikaa Udasi brings to us the story behind the forest warden, the writer and the wanderlust. With Wild In The Backyard, you’ve made it to the shortlist of The Hindu Young World – Goodbooks Best Author Award 2017. Congratulations! January 2017 could bring in great news. We are doubly celebrating because one of our Book Trotters – Tanay Bhat – reviewed your book and got published in The Hindu. I am delighted to make The Hindu-Goodbooks shortlist! Yes, they will be announcing the results in January during The Hindu’s Lit for Life literary festival, where I’ve been invited as a speaker as well. Hadn’t thought that I would be a part of the award ceremony too! Your book The Elephant Bird was Pratham’s choice for PBChampions for promoting literacy. How was that experience? I had not understood the scope and reach of this campaign when the book was selected. It was only when the pictures of sessions started pouring in from all over the country when it struck me. Sessions conducted by volunteers and communities in 25 different languages at 3200 plus locations from slums to the schools for specially-abled to Pranab Mukherjee’s Presidential Library! It was overwhelming, indeed, to see Munia and the Elephant Bird touch the hearts of so many children. Kudos to Pratham Books and the volunteers! A forest warden and a writer. That’s got us intrigued already! Please tell us about your background. I come from a family of jungle lovers. My grandfather was one of the earliest big game hunters-turned-conservationists of India. He was a contemporary of Jim Corbett. My naturalist father Dr Raza H. Tehsin, fondly known as the Vasco da Gama of Mewar jungles is the initiator of the wildlife conservation movement in Southern Rajasthan. I have seen him fight for issues of conservation and wildlife protection like I wouldn’t fight for my own family! I sort of grew up with jungles around me. My father was the Hon. Wildlife Warden of Udaipur district for 33 years and then I was appointed the honorary warden. He always encouraged me to write. I’d started writing features for The Times of India in my school days. It was my partner Aditya who pestered me to take my writing more seriously and that’s when I penned down my first book – Iora and the Quest of Five – a fantasy novel based in a rainforest. Since I had grown with wild around me, the settings and subjects of my books came naturally to me. Maybe it is the wild, jungles, animals…the things I love that inspire me. Anyway, I don’t wait for an inspiration. I just sit down and write. What do you find more fascinating – books or wildlife? Both. Equally. And both have been an integral part of my life. Wildlife – the real world around me. Books – the imaginary world I inhabit. Do you sense that today’s children are keen on reading non-fiction? Especially about the wild? Oh yes, anything that crawls, slithers, eats their own poop or has eight eyes is certain to grab their attention. Jerry Mander had said in his book Four Arguments for the Elimination of Television that after sometime, if you ask a child, ‘where do oranges grow?’ she’ll say, ‘in a supermarket’. Most city-dwelling children today are alienated from the wild. But they are nonetheless fascinated by it. The problem is that there aren’t many avenues to bring them close to nature. I have observed the fascination of many young readers during my interactions with them – talks at literary festivals and schools – how much they enjoy knowing and reading about the wonders of the wild. We know a lot of research goes into every book of yours. Could you tell us a little about how you structure out your book writing process? Yes, many long hours of research go behind writing non-fiction books. Even behind fiction to a certain extent, if it has to ring true. Each book is different. And there is no set method to structure a book. For non-fiction I sometimes decide to divide it in chapters that I want to write before I begin. For fiction, especially novels, I draw a rough outline of the story and then let the story guide and lead me as I write. Sometimes it turns out to be completely different than how I had imagined it to be. Can you tell us what’s in the offing? The book called The Steed of Jungle God, which should hopefully get released this year. It is a collection of stories on my father’s 70+ years of experiences in the forests of Mewar, the phenomena which he has come across in the wild which can attributed to ghosts and spirits and his quest for rational explanations behind those phenomena. A piece of advice for our budding writers please! Books can be your best teachers and friends. Read a lot. Write a lot. Hone your skills. Don’t get stuck with the “rules” of writing. Or make publishing your final goal. If your writing is good enough, it will happen. Writing should be like Nature – original, unpredictable, green, fresh and wild, of course.